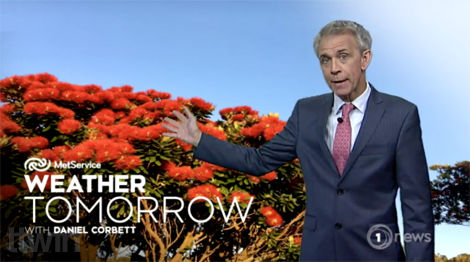 Today's weather was a bit like taking that plate and going to the buffet table and loading it all on [energetic plate-filling gesture], you've got all the different weather going on - and then grabbing that second plate and just having all the active weather. The fine summer weather so far has been a bit like standing at a bus stop on a Sunday morning waiting for that rush hour bus; you're sitting there [looks at watch] and it never arrives - but believe it or not there is the final bus coming down the road and we will eventually get some more settled weather. 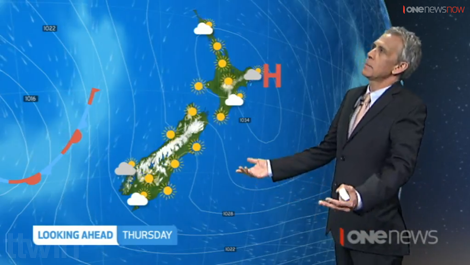 You will think by midweek that somebody has literally taken the weather rulebook and thrown it out the window, [gestures doing so]. 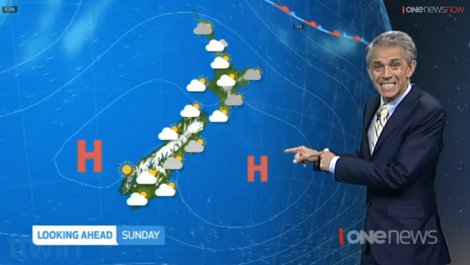 Certainly some changes in our weather over the next couple of days. It's almost like looking at an ice sculpture, sitting there frozen, and you start seeing one or two drops. The Dominion Post has published an interview with/article about Dan this weekend, with a few little snippets of information which are new even to me. However, given the inaccuracies in it about this blog, perhaps the other 'facts' are not so true either. 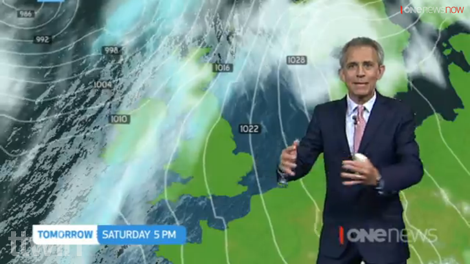 There is a cult (well, a fanblog) in the UK that streams our weather broadcasts, out of season, in devotion to TV One weatherman Dan Corbett. 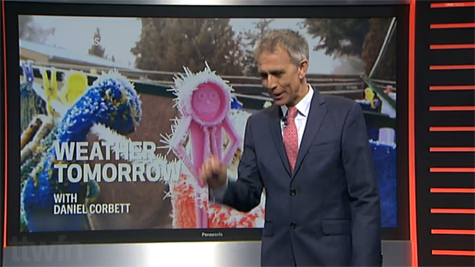 Streaming Corb's forecasts? I WISH! It's hard enough just to watch them before they vanish into the ether, let alone stream them. Gah! 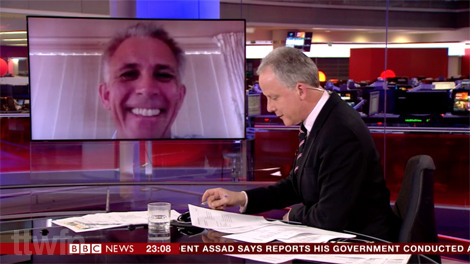 The former BBC weather presenter's quirky screen style – all fingers, anthropomorphism, and advice – has hooked fans here too, as well as earned the odd comparison to a gecko climbing a concrete wall. On-screen he admonishes the "big mean uglies" that disrupt picnicking plans, and coos almost proudly if "Mother Nature finally read the emails for some decent Christmas weather". 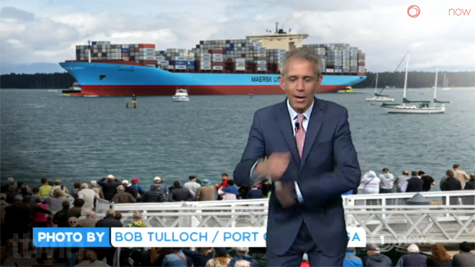 He's described trough lines across the Pacific as "sort of dancing about like a blue sausage", referred to ducks clutching umbrellas and donning coats if it's raining hard, and is quick to tell you when it's "time to put the barbecue back in the garage". 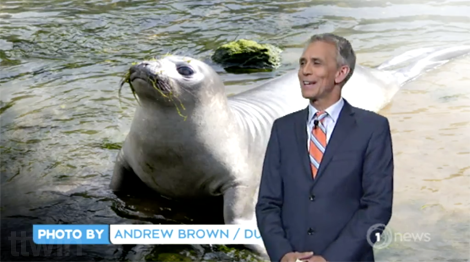 His turns of phrase have been dubbed danisms by 'That's the Weather, For Now' – his dedicated fanblog – and are all ad-libbed on set. Calling them Dan-isms (capital letter is important, hyphen unnecessary) wasn't my idea - seem to remember having read it online somewhere. "It's important for someone like me, who's in your living room just a few minutes in the evening, to conjure up mental images that will stick – otherwise it's pointless. 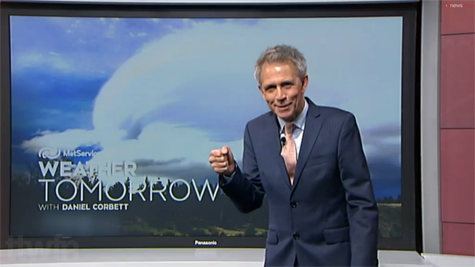 People would turn to look at their partner at the end of a bulletin and ask, 'so what's the weather tomorrow?'" Conjuring up the mental image of Dan in my living room. Quick, best have a tidy up. 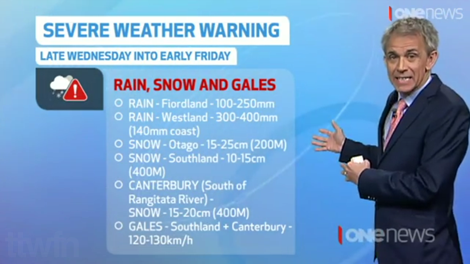 Mother Nature's gonna open up the Tasman Sea and literally take both barrels and point them right at us. 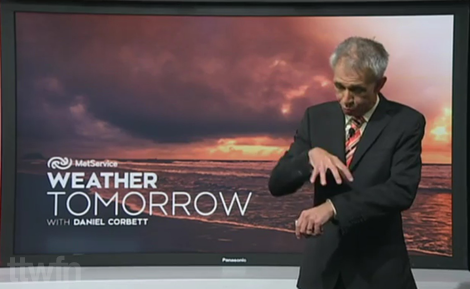 Welcome to 'That's the Weather for Now' - a Daniel Corbett fanblog. Came straight to this archive page? Click here for the latest Dan-isms, pictures and news. 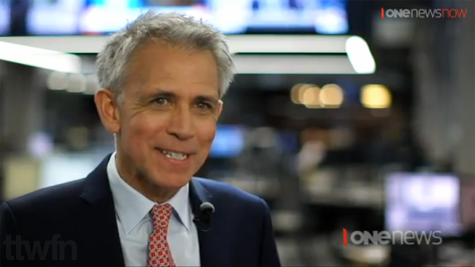 The video on this piece by Dan-fan Chris Chang is worth a watch from about 1m 12s in. With Mother Nature it's always the case, it's never done until, like at the circus, the fat lady sings. 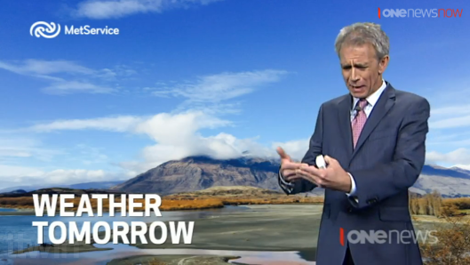 Mother Nature's got winter on the cards. 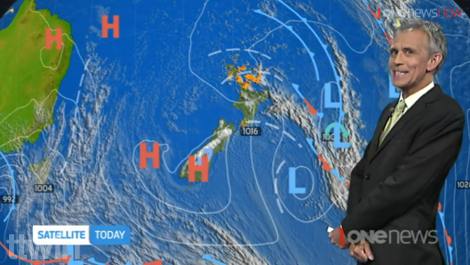 The big blue elephant, that's the next weather system coming in for Monday. It's like a laundry list of weather. 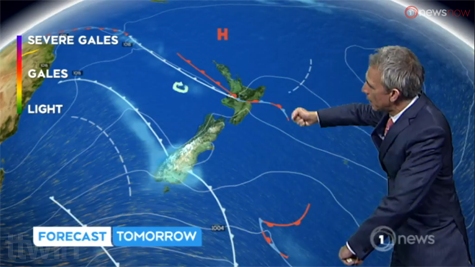 Good night for the fire and, these pegs on the line down south, they'll be literally knocking at the door to come in. 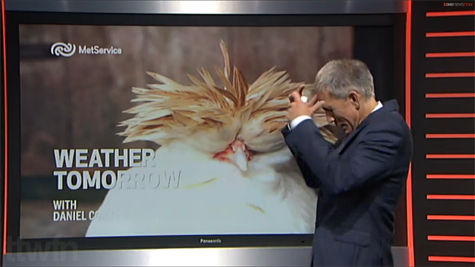 It's been a soggy day across some parts of the country and, ladies, I know a bad hair day can sometimes happen. Take, for instance, this poor Polish Bantam there, sitting there [see photo], brrr! You could almost put some sticky-backed glue onto the back of the high [glueing gesture] and it sits there. Cirrus uncinus or mare's tails, looking like the end of a horse tail there of sorts. I've had our One News weather radar on full beam and look what I've just seen. So, kids, we're in good shape, he is coming. Just of course make sure the food the snacks are ready, carrots for the reindeer, and everyone's alright. 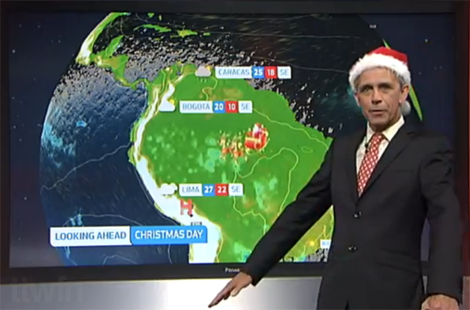 Christmas weather: What can Santa expect around the globe? 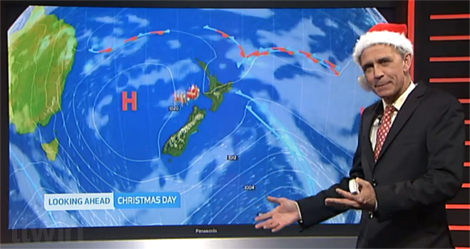 A special global forecast "for the big guy in red." He's gonna visit all the spots, probably hang out at the beach in the early morning hours. And then, he doesn't hang about, voom, he's off and all the reindeers are just galloping their way through. Shoooom! Straight through, hanging on to those reindeers as he continues to churn through. Rio de Janeiro, he’ll be sitting on the Copacabana, maybe catching some rays for a time. Watch it on One News. 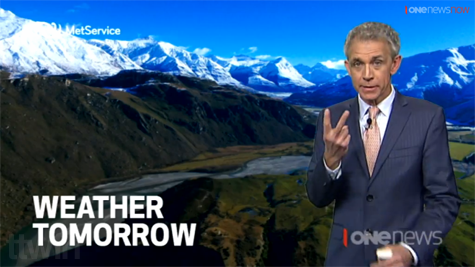 So much for 'ten days on the ice,' - this was Dan's last AntartiCorb forecast. Couldn't seem to find video evidence of this online, unfortunately. 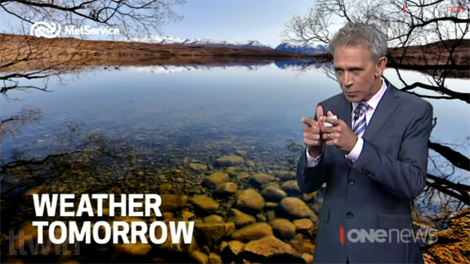 Despite the title, that's your weather for now, apparently. It looks like I'm bundled up again like the Abominable Snowman. 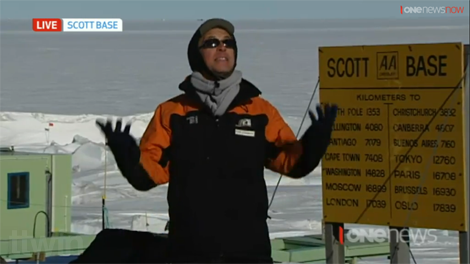 Dan's off to Scott Base in Antarctica! 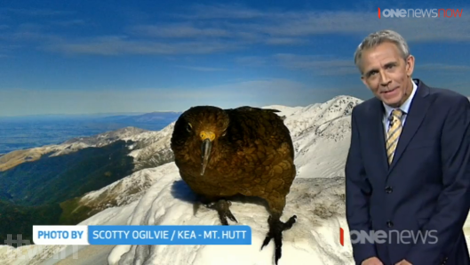 There's a short video clip about it on One News. 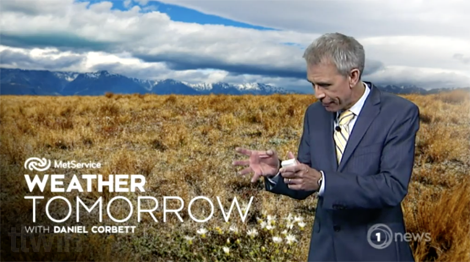 Along with Camerman Mike Fitzgerald and Reporter Lisa Davies, he will be doing the weather bulletin from the ice and filming a series of stories showcasing the weather on the windiest place on the planet, and looking into the amazing range of science research projects conducted there. The team head down early tomorrow on a C17, a five hour trip, and will spend ten days on the ice. 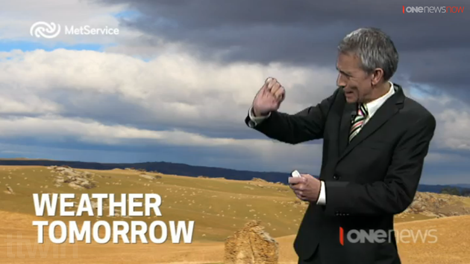 Unfortunately, bad weather has prevented them from travelling any further than Christchurch. Really looking forward to this - almost as excited about it as if I was actually going there myself. With the heating of the day, vvv, there they are, the big lumps, like you think I've taken some blue paint and daa-d-daa [painting gesture]. 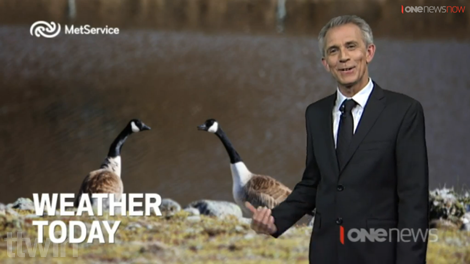 We're all getting into the All Blacks spirit, even the geese down south, if you can believe it. Just kidding of course, they are Canadian geese, but you look at the colours and you go [squints?] you sort of take a second take for instance there. 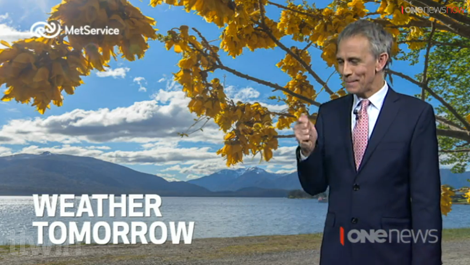 Some decent-looking weather for the outside. You can finally take the raincoat, the umbrella, put it aside for a couple of days, barbecues and instead get the tongs ready, sunglasses. Outdoor plans, cut the grass, you've got no excuse, you're probably gonna have to do it. Seventeen and a nice day. It's like a picnic lunch sort of day. 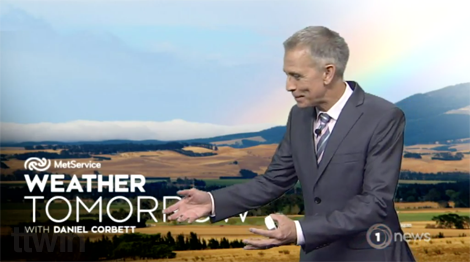 In other wedding-related news, TVNZ weatherman Dan Corbett and his wife Helen are celebrating 15 years of marriage, the Woman's Weekly reports. The UK-born pair, who now live in Warkworth, met in 1997 while working for the BBC in London. 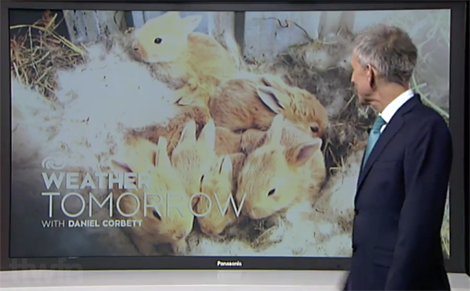 Corbett was a young weatherman, and Helen was the makeup artist. 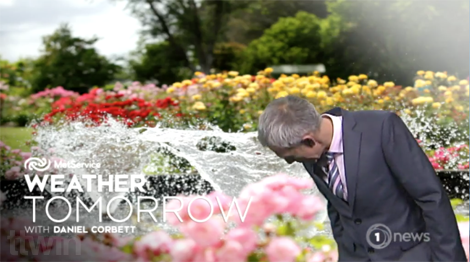 Corbett joked to the Woman's Weekly that on the day of the couple's wedding in Ireland, it unexpectedly rained. 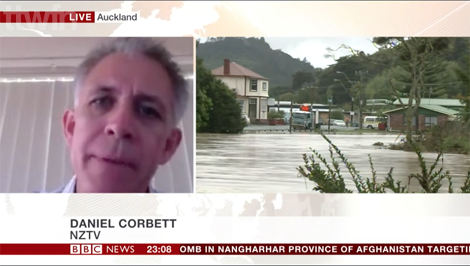 "The priest came rushing into the chapel and said, 'Ladies and gentlemen, I've just had a call from the BBC that Dan Corbett is fired because he can't even get the weather right on his wedding day!'" Congratulations on your wedding anniversary, Mr and Mrs Corb! 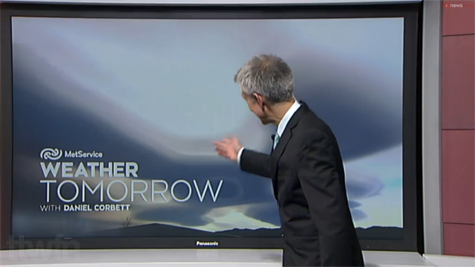 After the last several days, a bit like Groundhog Day, talking about the same weather system. 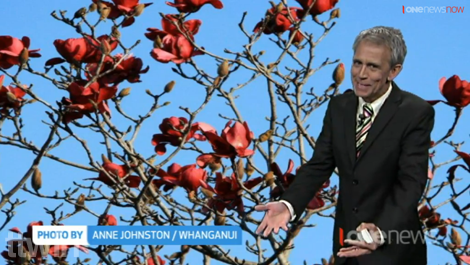 It looks like Mother Nature finally got the email about the school holidays coming. Might even be a picnic day, you never know. Sunday, this is a decent day. If I was picking [thinking gesture], picnic day or something or outdoor plans, yes. 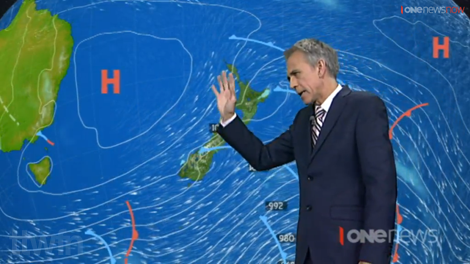 That southerly really makes you know, hehe, winter still wants to sort of knock on the door. 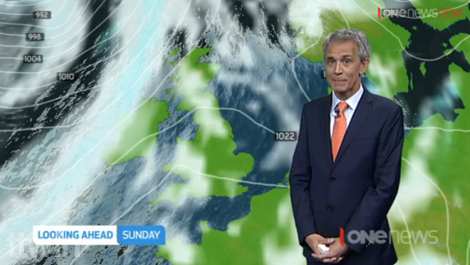 Exactly what we've been longing to see for years, Dan back in front of a map of the UK. Unfortunately, this is just for the Rugby World Cup. 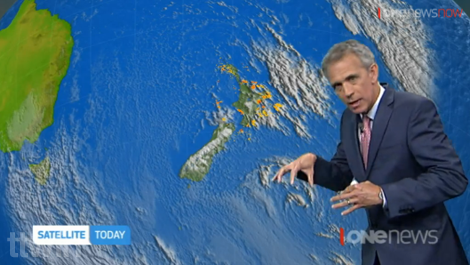 You can see the mass of cloud out west, we've had the wet weather over parts of the South Island, the whole thing, like a big grey sausage, will bend its way in. 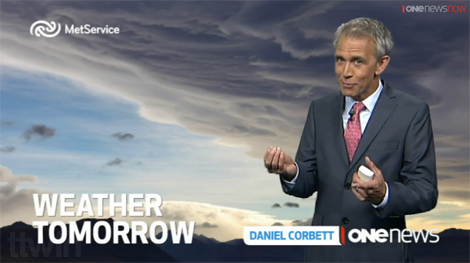 The king of weather presenting as twisted TV gold is, however, ex-BBC man Dan Corbett, now plying his trade in New Zealand. His Stanley Unwin delivery won him huge affection from British viewers. 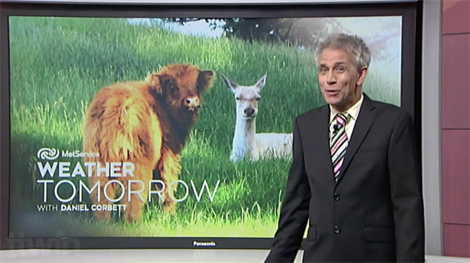 “Nice day for the afternoon,” a typical Corbett bulletin would say, “maybe a picnic or so perhaps in Northern Ireland, into Scotland and 26 for Cardiff.” Only a tiny minority of point-missing viewers used to complain that Corbett left them confused about what the weather would be like. 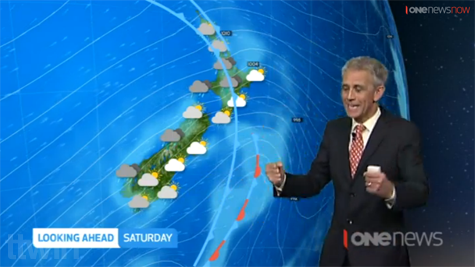 King of weather presenting indeed. The big incoming high is working in. It will have a couple of flies in the ointment, it's going to be a bit smudgy. 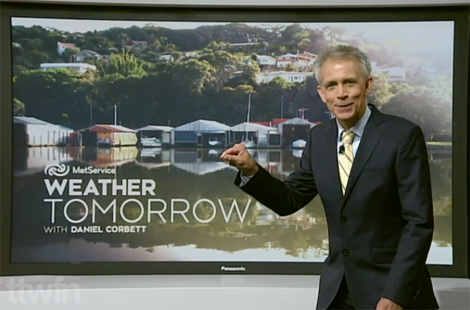 I wouldn't call it quite dirty, so there will be some extra cloud with it - a bit like cleaning the windscreen of sorts and you still have a few smudges there, that'll be like our high. The high builds in, his little brother joins the party. Maybe just that odd shower but they're more passing ones, not ones where you'd sort of cancel that visit maybe to the outside. 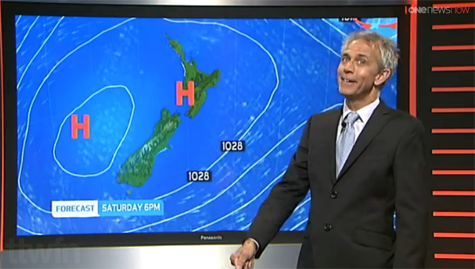 Wellington has breakfast with the trough. 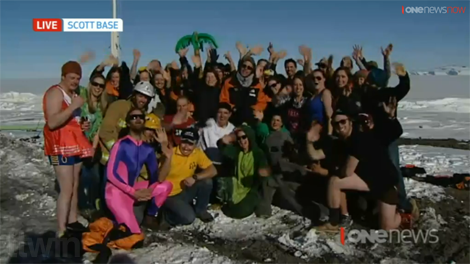 There's video of this one, below. 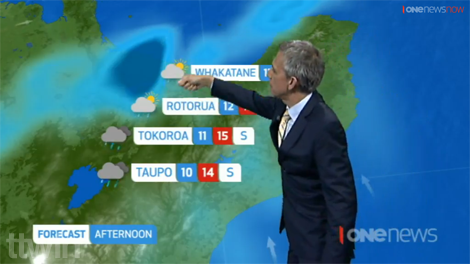 Good-looking rain band there, the line of colour almost like we've had the red crayons and gone, bvmmm, like that [slight scribbling gesture]. There's the front, notice the blue, that is of course the rain. See how it just changes colour like a blue crayon [scribbling gesture] like that. 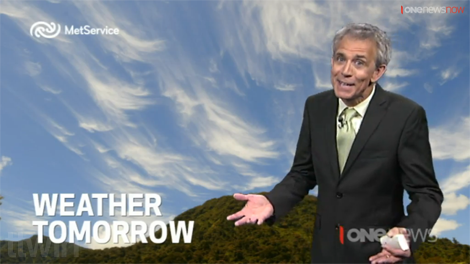 The end of the week looking very promising with a nice big high and you say, 'spring on the horizon?' We're getting to the end of the month you go [beckons] come on. You see how it's just lots of bits of clouds spinning around, a bit like a washing machine where you look straight down, you see different lumps of clothing, different lumps of energy. 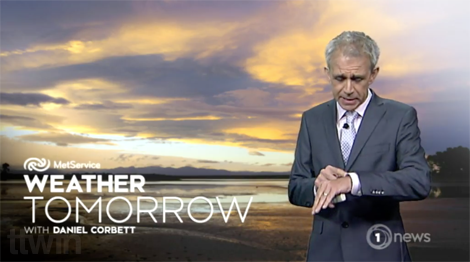 Get ready for some significant weather, some nasty weather as Mother Nature really just turns up the screws as far as an active weather system. This is literally like a Saturday shopping list.